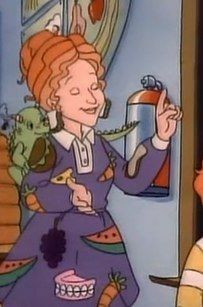 Ms. Frizzle’s clothes were epic, pattern-obsessed, pre-Etsy twee perfection — and I’m worried that the reboot, The Magic School Bus Rides Again, which released its first trailer today, may not live up to those standards. What about when they learned about dinosaurs and Ms. Frizzle wore a pair of magenta triceratops heels that I would find and kill an actual dinosaur to get my hands on? Or when she wore a food dress complete with a pair of teeth and earrings that were tiny slices of bread? When they studied weather, her shoes had tiny umbrellas on them! Fashion wasn’t frivolous with Ms. Frizzle. It was integral to the lessons (well, at least relevant to them) and truly made them more memorable. And, okay, fine, we haven’t seen enough of this new Ms. Frizzle, voiced by Kate McKinnon, just yet. But from the scenes in the trailer, it looks like her sartorial creativity in the classroom is confined to her skirts only, plus a pendant necklace that changes ever so slightly per lesson. Did this new, younger Ms. Frizzle not inherit her older sister’s penchant for crafting? Is she a J.Crew acolyte who only knows how to wear one statement piece at a time? I don’t know, but these simple red ballet flats and plain blue sweater are breaking my heart. There’s a little hope, though. New Ms. Frizzle at least knows how to dress for the occasion, and we do see her in a wetsuit and a cavewoman dress (looking very much like Wilma Flintstone). And maybe that necklace will get funkier, or inspire her to pick up a wacky pair of shoes. And who knows, maybe the old Ms. Frizzle (who now goes by Professor Frizzle) will lend her a box of vintage hand-me-downs with some dusty syllabi. Here’s hoping her wardrobe gets kicked up a notch — and in the meantime, I’m going to scour the internet for some Jupiter earrings.